SNES Gradius III (JPN) "100% kills" in 30:23.42 by Warp. 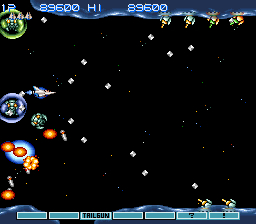 Gradius 3 completed in Arcade mode. This movie is similar to Tviks' movie, except that this one aims for 100% kills. Everything that can be killed is killed. At the later levels that's really hard to accomplish. Category "uses passwords" is selected because the Arcade mode seems like a secret option in the game.